F-18 E/F: Heritage F-18 All Fixed, But….Surprise! Part 3 in a series of posts where we document The ‘Profound Truth’ of High Angle-of-Attack (AoA) flight testing of high performance aircraft. Discovery and rectification of undesirable aircraft behaviors during High Angle-of-Attack testing of High Performance Aircraft is not only the ‘Norm’, but those behaviors needing rectification/mitigation are usually complex, sometimes bizarre, and often ‘spectacular’. As in the F-18A-D post, we will avoid mentioning all other problems that the F-18E/F program dealt with that did not have to do with the AoA performance, behaviors and testing. They still would be helpful highlighting in yet another way: illustrating how the F-35 program isn’t as ‘concurrent’ as some would lead us to believe. But I’ll (again) resist the temptation to beat that ‘dead horse’. The F-18E/F is ANOTHER excellent exhibit of the Profound Truth. In closing Part 2, I observed that “many of the design objectives behind the F-18E/F were focused on eliminating the extant problems and limitations of the Heritage Hornets”. In Part 3, we will observe how an entirely new set of challenges emerged for the F-18E/F. I would call the challenges “problems” if we were all thinking like Engineers: “A problem is normal, something to be expected, and something to be solved”. But too many people seem to think a problem is a reason to NOT do something (as if there is such a thing as a ‘problem-free’ path in any worthwhile endeavor). On the topic of solving problems, engineers in any field know that it is almost always the case that a feasible solution will involve making ‘tradeoffs’. The F-18E/F, like the Heritage Hornet, was no exception to the rule. 1. Enhanced departure resistance and post departure (should it still occur) elimination of “falling leaf” or unrecoverable spin modes. 2. Requiring the aircraft to meet all flying quality requirements with a centerline fuel tank since this is a common operational configuration in all services, foreign and domestic. 3. Elimination of high AOA hang up and the accompanying AOA/cg restrictions. 4. The aircraft must be able to land on an aircraft carrier following most flight control failures. 5. Improved roll performance at elevated AOAs in the gear up/flaps Auto configuration. 6. Expanded tactical utility with large lateral store weight asymmetries (since high value stores are frequently deployed one at a time and can result in significant lateral weight asymmetries and aircraft maneuvering limitations after release of one store). 7. Reduction of likelihood of encountering pilot induced oscillation/aircraft-pilot coupling tendencies. 8. Adequate control following a dynamic and/or static loss of one engine (which sized the F/A-18E/F vertical tail). The F-18E/F program objectives Hanley describes were rather admirably met in the end, but Hanley also cogently summarizes the REALLY big surprise that the F-18E/F designers had to overcome. Every flight test program encounters some “unknown unknown, “things that were not planned, thought of, or considered possible to occur in flight-testing. The Super Hornet was no exception. Early in the flight test EMD program, the aircraft experienced uncommanded “wing drop” during wind up turns and straight and level accelerations. As the program matured and the envelope expanded, it became clear that this was a serious problem that would impact aircraft performance if not corrected. Some of the flight test “fixes” assessed included modified snag locations, vortex generators, grit, stall strips, modified flap scheduling, control surface biasing, fences and porous wing fold fairing covers. Eventually, the porous wing fold cover proved to be the most effective solution to the “wing drop” phenomenon, by dissipating adverse pressure gradients fore and aft of the shock forming on the wing and reducing the effect of the asymmetric stall. There was an interim step to arrive at the ‘porous cover’ solution, whereby enterprising Navy types tried removing the wing-fold cover entirely, finding it pretty much fixed the ‘wing drop’ but created too much drag to meet other requirements. That’s when NASA stepped in with the half-way between 'none and one' cover, to make it a 'porous' cover. What the Hanley paper doesn’t really highlight at all is that the two factors that made this behavior SO alarming were 1) the abruptness of the phenomenon and 2) the apparent randomness of the direction the plane would roll. Initially, the F-18E/F was to be a stopgap (for the A-12 and/or later, the JSF). The initial concept was to simply scale up the wing and control surfaces about 25%, put fuselage ‘plugs’ in to increase fuel capacity and put bigger engines in the stretched fuselage to power it all. The first ‘better idea’ came from the structure guys. They’d felt the Heritage F-18 wings weren’t quite rigid enough and wanted a less flexible wing. They sold the idea of increasing the wing thickness to improve stiffness and allow a lighter structural weight ratio as well as adding more fuel volume. The next ‘better idea’ came from the “systems guys” who sold the idea of reducing the proportions of the leading edge flap chord, which meant lower hinge moments, which allowed reuse of the Heritage Hornet actuator designs and save money. That move also meant even more fuel could be carried in the wings. Early F-18E/F Modeling showed that simply scaling up the F-18C/D wing, with the original twist and camber, would increase supersonic drag and threaten the ability to beat the maximum time requirement for dashing from subsonic to supersonic. This brought about the next ‘better idea’: ‘straighten’ the wing to reduce supersonic drag. Straightening the wing was seen as beneficial in lowering manufacturing costs as well. The next ‘better idea’, theoretically to improve resultant high lift performance, was to put a leading edge ‘snag’ at the outer third of the wing that would generate a vortex. This move was puzzling. As one of my ‘Aero’ lecturers noted: it didn’t work on the F-18A, so it was taken out of the C model. What made the designers think it was a good idea to bring it back? My lecturer observed that it was probably due as much to the design culture at Boeing née McDonnell Douglas St Louis, which has seemed to favor using leading edge ‘snags’ for decades (most prominently the F-4 Phantom). The F-18E/F designers then also modified the LEX, but that was believed to more likely have been done to aid in eliminating the ‘alpha hang-up’ mode and increase ability to point the nose down in such an event. I should also add here that the E/F’s wing drop ‘fix’ of making the wing fold cover ‘porous’ is believed to have a supersonic drag penalty greater than there would have been if the designers had left the twist and camber in place. All the successive changes didn’t trigger alarms in (the right) people’s minds that maybe the F-18E/F would no longer be quite as simple a derivative as it was first proposed. The F-18E/F did not have to go through nearly as many ‘wickets’ as a new-start program (GAO,1994). The wind-tunnel and computer simulation effort was not as thorough as a clean-sheet design (such as the F-35) would have executed prior to design freeze and manufacture. Only AFTER the F-18E/F was actually flying was the scope of the problem revealed. Not that a full wind tunnel and simulation would have helped. The Abrupt Wing Stall (AWS) program instituted after the F-18E/F wing drop made its self known required increased computing power and more detailed wind tunnel data to adequately examine the phenomenon. Source: “Introduction to the Abrupt Wing Stall Program”; Hall, R.M., Woodson, S.H. ; JOURNAL OF AIRCRAFT, Vol. 41, No. 3; 2004. 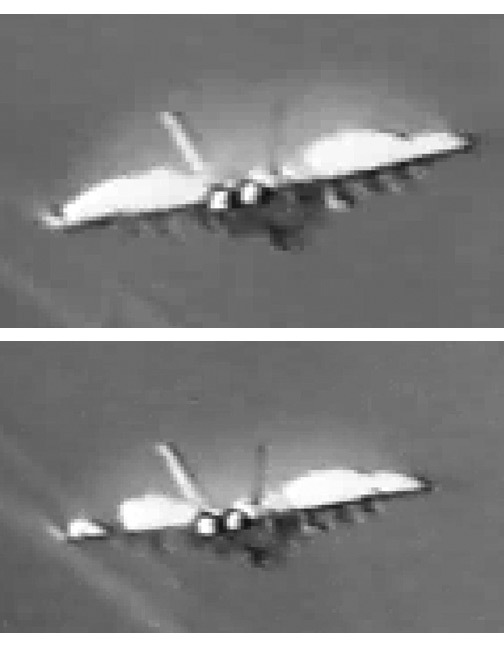 The lower photo shows a gap in the normal low pressure condensation making an intermittent appearance near the “wing drop angle of attack” (Hall & Woodson). The ‘wing drop’ issue was probably the best known challenge the F-18E/F overcame, but there were some others “interesting” behaviors that had to be wrung out that the public never really heard about. Predicted modeling of a ”step left-and-full-aft stick command at 200 KCAS predicted a sharp left roll and pitch up into stall, a benign outcome”. The actual result provided the "most significant surprise of the program". Within 3s[econds] of the input, the airplane rolled left, pitched up, and then departed nose right, going flat plate to the airstream in the negative direction. The resulting 3.7-g Nz exceeded the structural design limit, and the pilot’s helmet struck the canopy with sufficient force to leave an audible crack on the cockpit recorders…. …The next point was to have been 300 KCAS, doubling the dynamic pressure. Whereas the aircraft had tracked the simulation predictions earlier, this departure was completely unexpected (5 min earlier, the team had told the pilot that this would be a benign event). Departure testing was suspended for four months to allow for analysis, redesign, testing, and fielding of new FCS software (Heller Et Al). During the four month downtime, the F-18E/F team discovered that the “aircraft aileron power had been significantly underestimated” (by about ~20%), but most disturbing was that with this new information, the team could see that if they had proceeded with the 300 KCAS airspeed test point, they would have “exceeded the ultimate strength of the airplane” (Heller Et Al). Finally, A mode that manifested in a “significant minority of spins” was “a change in polarity” during recovery. An upright spin would suddenly flip to ‘inverted’, and inverted spins would suddenly flip upright. Viewed directly from above or below, the spin direction would not change, but from the pilot’s perspective, “an upright spin to the right was now an inverted spin to the left.” Or vice versa (Heller Et Al). The ‘fix’ was made in the Flight Control System software to first recognize the ‘flip’ and then provide the pilot with correct display information to assist in the recovery. There were a few other aero performance challenges the F-18E/F engineers and test teams discovered and overcame, but IMHO none as spectacular as those we’ve just covered. The F-18E/F was perceived as a ‘low-risk’ program containing evolutionary and NOT revolutionary advancements in Warfighter capabilities. Yet incremental ‘tweaks’ to the design as it progressed added hidden departure modes, some of which at the time could only have been ‘discovered’ and not ‘predicted’. While the F-35 benefits from advancements that High AoA research produced in the wake of the F-18E/F, the F-35 is a ‘clean-sheet of paper’ design and not a derivative of something else. The potential for unknown-unknowns is seen to be higher AND seen to be worth the effort. Keep the F-18E/F lessons learned in mind the next time the legions of uninformed and/or irrational F-35 critics begin their silly chants. As my Aero lecturer was fond of saying: there’s a surprise hidden inside every airplane. “Operational Lessons Learned from the F/A-18E/F Total Flight Control Systems Integration Process”; Hanley, R.J., Dunaway, D.A., Lawson, K.P. ; NAVAL AIR SYSTEMS COMMAND PATUXENT RIVER MD, June, 2001. 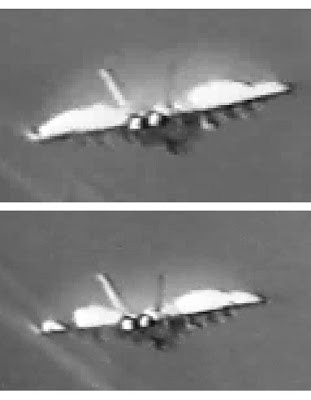 “Transonic Unsteady Aerodynamics of the F/A-18E Under Conditions Promoting Abrupt Wing Stall”; Schuster, D.M., Byrd, J.E. ; JOURNAL OF AIRCRAFT, Vol. 41, No. 3; 2004. “F/A-18E/F Super Hornet High-Angle-of-Attack Control Law Development and Testing”; Heller, M., Niewoehner, R.J., Lawson, K.P. ; JOURNAL OF AIRCRAFT, Vol. 38, No. 5; 2001. “Naval Aviation: F/A-18 E/F Acquisition Strategy” (Letter Report, 08/18/94, GAO/NSIAD-94-194). “Introduction to the Abrupt Wing Stall Program”; Hall, R.M., Woodson, S.H. ; JOURNAL OF AIRCRAFT, Vol. 41, No. 3; 2004. Great posts. Do you have links to the papers please? I'm not pulling the data off of the open web, but from my own archives and from the AIAA member-only library. If you do a search on the titles, all but the JOURNAL OF AIRCRAFT peer-reviewed papers should show up. I'm told there is a non-Journal version of the AIAA 'Introduction to the Abrupt Wing Stall Program' on the NASA public servers. That paper is probably pretty close to the Peer-reviewed version.